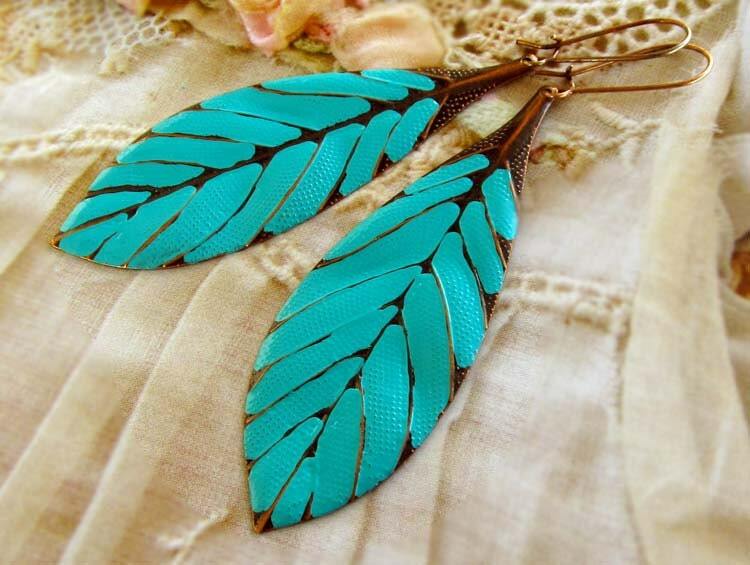 Fun, flirty leaf earrings are super light in weight! I hand painted metal antiqued copper finished charms a fresh turquoise. The tapered leaf shape also resembles a feather. The metal is thin, making these long earrings feather light! You choose earwire. See last photo. Ear wires are nickel safe. You will receive your earrings in a pretty silver foiled gift box via First Class mail. ~~ Flat rate shipping, no matter how much you purchase! I wore these on a trip to Las Vegas and received so many compliments. I love them! Great shop to work with, and speedy shipment and delivery. I wore these earrings for the first time today. They are fantastically light weight and comfortable. I lost count of the number of compliments I got about them too! Flat rate shipping, no matter how much you purchase! Gypsy Moon Designs accepts Pay Pal payment and Visa, MasterCard, EuroCard, American Express and Discover through Etsy direct checkout. I will be happy to reserve an item for you. Contact me and I will do so. I do ask that you pay prior to me shortening or lengthening a piece of jewelry. Please Note that I do not ship to all countries due to lost mail issues. Nothing personal! Shipped items are well packaged and cushioned. I have been creating jewelry for many, many years and take the utmost care in providing a quality product. Returns must be made within 7 days of receipt of items and returned with tracking number. Items must be returned unworn and in same box it was received in. Return packaged jewelry in a bubble wrap envelope...I suggest reusing envelope you received jewelry in. Customer responsible for return shipping cost. Items received broken due to return not being packaged properly can not be exchanged or refunded. If International Orders are returned due to customer not wanting to pay custom and duty fees that their country charges there is no refund for shipping. I ship within the U.S. and Internationally. Some countries are excluded. I do not ship to Italy and Greece and many South American countries due to lost mail. I currently do not ship to Germany due to new laws that have been enacted in regards to Packaging Act. You will receive your jewelry in a cotton filled jewelry box via First Class mail with delivery confirmation. Combined shipping rate only applies to items that can be shipped together to the same address. International orders are mailed First Class. Jewelry is mailed in a cushioned or bubble mailer. Multiple items may be shipped in same jewelry box. If you need each item in an individual box please let me know. I am happy to adjust lengths, switch out ear wires and such, but as a one woman business I am not available for custom orders. My local shows and wholesale accounts along with my Etsy shop just don't allow enough hours in the day to work on custom pieces. Thanks for understanding. I will respond within 24 hrs, if not sooner. Yes, I wholesale to shops. Please contact me for more info. Oct 31st is the cutoff date for holiday season wholesale orders. Sorry, we do not do trades or give our jewelry away for free. Gypsy Moon Designs donates to local charities in the Missoula, MT area. If you are a local non-profit, please feel free to email for a donation. Yes, I wholesale. Contact me for more info.